Phantom2 Animal Transfer Station | Allentown, Inc.
2 good to be true! We took one of the best selling animal care products in Allentown history, and decided to make it even better. How? We polled hundreds of satisfied Phantom users, and asked for their wish-list if we ever created a Phantom2. With that input, the best animal transfer station on the market got even better. Watch the video to learn how the Phantom2 is almost 2 Good to be True! 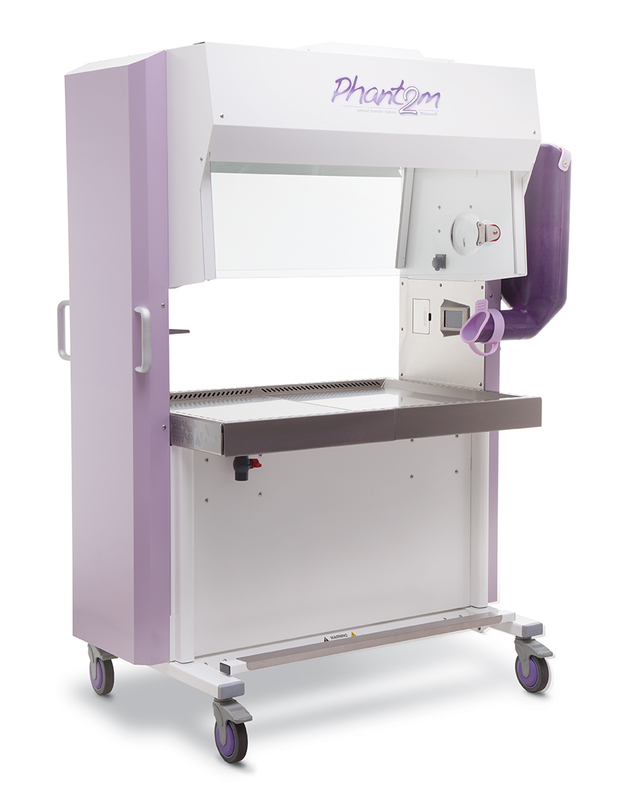 By our research there are no other animal change stations which provide ISO class 3 airflow. We've achieved this industry-leading airflow quality by a new upper HEPA filter design, double HEPA filtration, a redesigned air diffuser and upper glass sashes. Now we're able to provide airflow with one .5 micron particle per cubic ft of air...ten times the air cleanliness than ISO class 4 change stations. Another airflow advancement is the new Active Barrier Containment™ ABC™ which provides an air curtain outside of the front sash for an additional level of protection for the work surface. The heart of the Phantom2 is its new and improved user interface, which allows quick and easy access to new Phantom2 ergonomic features. Display functions are mainly icon driven, and are translated into 8 different languages when text instructions are present. 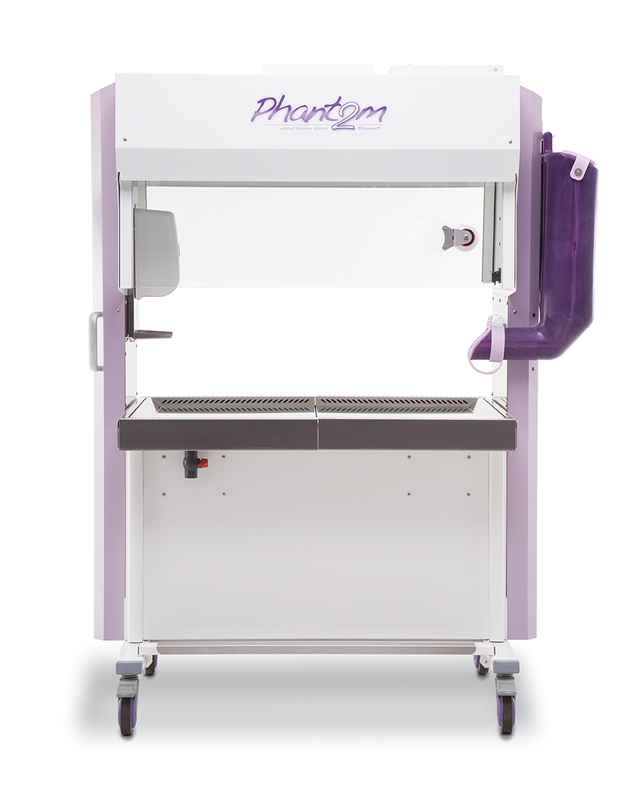 The color screen is where users will activate and dim the new LED white and red lighting, pre-set user height settings of the new faster and quieter lift system, active the ECO mode to save energy when the unit is not in use, and many other ergonomic features designed to make the user experience with the Phantom2 easier than ever. New LED Phantom2 lighting is not only energy efficient, but at 6000K brings a highly functional amount of white light to the work surface. If less light is required, the LED lights are dimmable to 10%. The red LED lights offer users the ability to work at the Phantom2 while guarding against disturbing the research animals' circadian rhythms. The red LED lights are also dimmable down to 10%. An increased work area opening height, together with a new dished-work-surface, allows users even more room to operate. More room means more comfort when using the Phantom2, making routine cage-changing tasks easier than before. Many other added convenience features such as the self-locking sash and hinged pre-filter retainer for easier access and replacement accentuate the Phantom2's overall design emphasis on ergonomics and the user experience. Start up the Phantom2 with a wave of your hand or any movement on the work surface, leaving you free to go about your business. Custom molded plastic food hopper allowing for easier feed dispensing. A plastic sash designed to close off the backside of the Phantom2. Installed pre-delivery by Allentown or at your facility and easily turns your Phantom2 into a single-sided change station. Add a high-powered magnifying glass anywhere on the Phantom2 sashes for enhanced visibility. 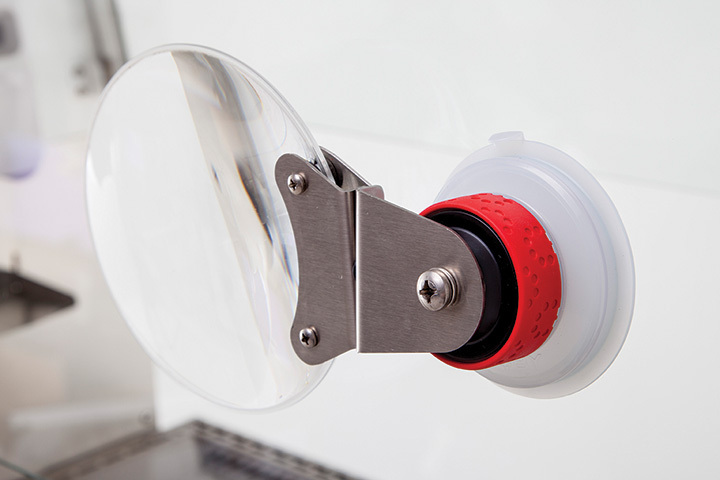 Place magnetic bumpers anywhere on the Phantom2 unit to avoid damage while moving unit through your facility. Drop the alternate Trespa work surface into the dished work surface for a different work-area experience. A convenient and out-of-the-way place to park lids during cage change. A variety of options to increase ergonomics, comfort, and convenience. The NexGen is new...but filled with the values that have made Allentown the number one housing solution provider to the Laboratory Animal Science community for more than 50 years. Dependability, performance, integrity, quality, value, expert manufacturing and renowned customer service...these are the attributes of the NexGen and every other Allentown housing solution. The Allentown FreeFlow Bedding Dispenser combines a wealth of input from end-users with a unique approach to design, resulting in a groundbreaking solution that's both highly effective and easy to use - freeing end users from the headaches associated with cumbersome installations, difficult transportation, and the need for compressed air for operation.